UT @ TX Tech. (Lubbock) A night game with temps falling from low 60’s to upper 50’s with mostly fair skies and a light breeze. NE @ OU—A night game with temperatures dropping in to the middle to low 60’s and partly cloudy skies. CO @ A&M—Afternoon sunshine with highs near 80. IA. State@ OK State—Pleasant weather with readings in the upper 70’s. Our first brush with freezing temps is coming Tuesday morning. A freeze warning is in effect everywhere but Dallas/Fort Worth. A great fall day with cool temperatures and sunny skies, but it is also dry and windy. These conditions could help to create grass fires especially in the afternoon today. Click here for the statement from the National Weather Service about the high fire danger. Now let’s talk about Fido and those new mums you may of just planted. Overnight, the temperatures will drop into the low 30’s close to freezing in some of the suburbs and rural areas. Dallas and Tarrant counties are not under a freeze warning, but counties to the north, west and east are expecting a light freeze. You may want to set aside sometime today to prepare your plants and pets for another cold night. A frost advisory has been issued for many places in North Texas for early tomorrow morning. Click here to read more. We are not expected to have a freeze tonight with the air temperature staying above 32 degrees, but the dew point temperature in some spots will drop to 32 or lower. The dew point measures the amount of moisture in the air. The dew point being so low aides in frost forming on solid surfaces, such as leaves and plants. Frost may not be a problem tonight for downtown Fort Worth or Dallas, but some of the suburbs and many rural areas are expected to experience frost. Last Time It Was This Cold: April 29th. Friday Morning should be nearly as cold (37 to 44) with a few isolated far suburbs reaching freezing and scattered frost across much of North Texas. I do love fall, but sometimes I dread asking my kids what they want to be for Halloween. This year I brought in reinforcements to help with the process of buying a costume. My husband and I took our girls to our local costume store and went straight to the kids department to take care of business. My six year old had been talking about being a witch for a few weeks now, so when we got to the wall of witches we asked her which one do you want to be? About an hour later her decision was made. The choices were overwhelming. There’s the plain witch, the candy corn one, the fairy witch, the one where you look like a ballerina, the pumpkin witch, the fashion witch and finally the winner, the one she choose was the witch that had a skirt with fiber optic lights all over. Why am I writing about my kids on a weather blog? Well, this is where my four year old comes in. For Halloween, she wanted to be a monkey(actually, it was a giant, but I talked the pint size kid out of that one!). But, the monkey costumes were covered in head-to-toe fake fur. Knowing my luck, the weather would be too warm and she would fight me about not wanting to wear it. So, I checked on the climate for Halloween. Normal values are 72 for a high to 51 for a low. But, who or what is normal these days? The hottest it has ever been was 89 degrees and the coldest was 29. So, if we look at the past to gauge the future, we could come up with temperatures dropping into the low 60’s to upper 50’s for trick or treating. By the way, my four year old decided on the patchwork witch costume. After a great win by TCU Thursday night, college football continues to heat up. Predicting the weather will be a lot easier than predicting the score for these Saturday games. Houston at SMU- game time 7pm. Clear skies with temps dropping into the mid to low 60’s. Missouri at Texas. 7pm. Sunny and warm for tailgating with numbers in the low 80’s, but by the fourth quarter temperatures will drop into the mid 60’s. Texas Tech at Texas A&M- game time 11am. Right at 60 degrees for the early tailgaters, however plenty of sunshine for game time and temps in the upper 70’s. Kansas at Oklahoma 2:30pm Sunny and mid 70’s. Baylor @ OK State 2pm A nice sunny homecoming in Stillwater. Temperatures will be in the mid 70’s. UNT @ LA-Monroe 6pm Sunny with afternoon temperatures in the middle 70’s, but kickoff the temps drop in the low 60’s. A front will roll across North Texas tomorrow evening, bringing cooler temps and a good chance of rain by Tuesday night and Wednesday. Severe weather isn’t going to be a big issue, since most of the showers and storms will be behind the front, not a favorable place to generate severe storms. Cooler temps are expected Wednesday and Thursday, with highs in the 70s. Every morning, Tammy Dombeck puts the Texas Department of Transportation (TXDOT) cameras to good use. On our morning newscast, she shows views of various highways, to highlight areas with accidents or congestion. But every once in a while, something unusual will show up. 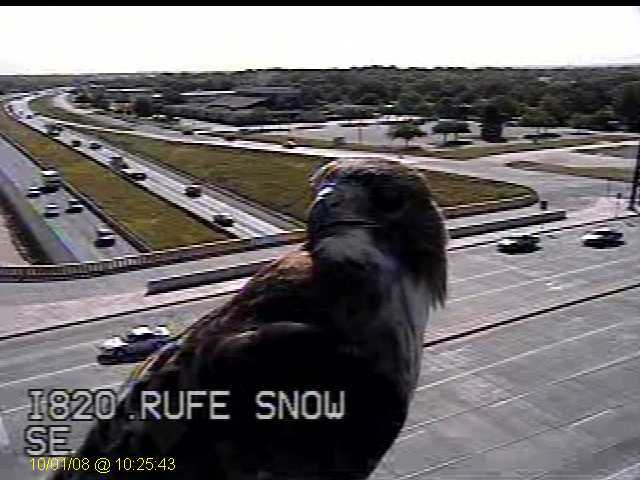 Look at what the camera caught at 820 and Rufe Snow in north Fort Worth. I am not much of an ornithologist. So correct me if I’m wrong. But I think it is probably a red-tailed hawk. And he turns his head to preen for the camera just as the photo is taken. The rain has now come to an end for North Texas; below you will find some totals from our weather warriors. Now the wind is here. A wind advisory has been issued. Look for winds to gust to 40mph through the afternoon. The wind should die down tonight and temperatures will drop into the low fifties with some patchy fog.